Rachel Grice is a contributing editor for LIVESTRONG.COM and certified yoga instructor who loves running on the beach, watching USC Trojan football and drinking red wine. Previously, she worked for Men's Health, FitPregnancy and People. Read more about her running adventures at thesoleofarunner.com. By now, most of us know not to believe everything we hear. And while it's good to greet every new piece of information or the latest fitness gadget with a healthy dose of skepticism, you also need a trusted source to help separate fact from clever marketing ploy. Enter Dr. Dennis Cardone, Director of Primary Care of Sports Medicine, Department of Orthopedic Surgery, at NYU Langone Medical Center. That mouthful of a title means he's well equipped to sift through and evaluate the dubious claims of your new workout buddy, that guy at the gym or the sports-drink salesperson. So if you've heard any of these myths, now you'll have science on your side when you respond. MYTH 1: The more you sweat, the more weight you'll lose — and the faster you can get into bathing-suit shape. TRUTH: Once bathing-suit season hits, it seems like all our logic and good intentions go out the window and we work out like maniacs to look better on the beach. But that's obviously incredibly dangerous thinking. Aim to exercise during the cooler parts of the day -- sunrise or sunset -- says Dr. Cardone. Look for shaded areas and wear lighter-color clothing with moisture-wicking fabric instead of 100-percent cotton. People, especially older adults and those who haven't worked out in a while, are particularly at risk for doing too much too quickly in the heat, which can lead to serious problems. Just as football players don't start out the summer with two-a-day workouts, you should also allow yourself to acclimate to the heat and gradually increase your outdoor exercise duration and intensity. Take frequent breaks (at least every 30 minutes), remember to hydrate (see below) and wear sunscreen! TRUTH: Stretching is an important part of any well-rounded exercise regimen, but aggressive stretching before a workout can actually increase your risk of injury, says Dr. Cardone. So when's the best time to stretch? Barring preexisting injuries, Dr. Cardone recommends having a separate stretch session (or yoga class) during which you focus on flexibility instead of having it tied to your more strenuous workouts. Or if you're forced to choose between before or after your workout, opt for after. Replace the time you would have spent stretching with a proper warm-up. For example, if you're going for a run, walk or jog for five minutes before hitting your stride. And if you're lifting weights or doing body-weight exercises, start with similar but less-intense versions of the exercises you plan on doing (i.e., body-weight lunges instead of weighted lunges). Same goes for your cool-down period. MYTH 3: Don't wait until you're thirsty to drink water. If you're working out outdoors, even for just an hour, bring along a sports drink to replace electrolytes you lose through sweat. TRUTH: Five years ago, conventional wisdom said that you should drink eight ounces of water every 15 minutes, regardless of whether or not you were thirsty. But it's actually OK to wait until you're thirsty, says Dr. Cardone. In fact, drinking too much water can result in hyperhydration, which causes sodium levels in the blood to plummet. That doesn't mean you shouldn't worry about hydrating during your workout, though. If you're exercising outdoors for 60 minutes or less, Dr. Cardone says you should aim to drink 20 to 24 ounces of water every hour. Anything more than that and you'll want to supplement with electrolyte-enhanced sports drinks. But regardless of exercise duration, Dr. Cardone recommends refueling with something salty (pickle juice, pretzels, salt tablets, etc.) afterward to replace the sodium lost through sweat. 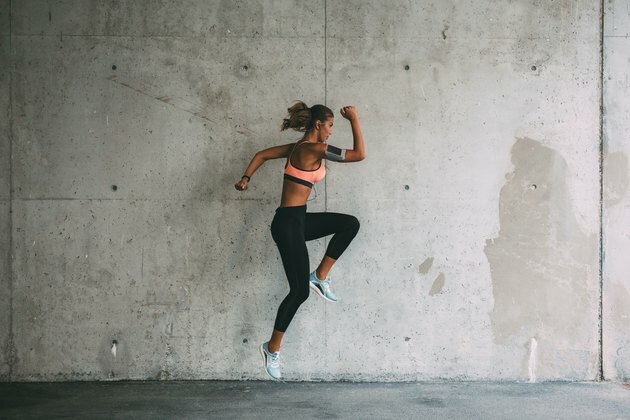 TRUTH: While many people believe that compression clothing improves athletic performance by clearing metabolites and other "debris" that accumulates in the blood during exercise, Dr. Cardone says that just isn't the case. However, while a 2010 study from Indiana University found no physiological benefits for athletes wearing compression clothing, researchers did notice that there was a positive psychological effect. That means any improvement in performance is due to you thinking your clothing is helping you function better. But if you do choose to utilize compression garments, Dr. Cardone recommends wearing them after workouts for about an hour to aid in recovery. Aside from the psychological benefit of feeling like you're taking an active part in your recovery, fluids may have accumulated in your limbs after exercises, so items like compression socks can help improve return of blood and prevent edema. TRUTH: Putting KT tape around your shoulder joint doesn't mean that you're going to be able to recruit those muscles more efficiently during your workout, says Dr. Cardone, or that wearing KT tape will prevent strain on that region by supporting the joint. That doesn't mean that KT tape is entirely useless, however. Some people will benefit from the added support during workouts, but only those with injuries and weaknesses that have been officially diagnosed by an orthopedist or physical therapist. Plus, as Dr. Cardone points out, they'll also be able to show you exactly how to tape your shoulder, knee or hip to best aid your individual physiology. For example, McConnell taping can assist normal tracking of the knee and help stabilize the knee joint. But, depending on how your knee functions, you'll need a physical therapist to show you the correct way to do it. TRUTH: Just like compression clothing and KT tape, most of the purported benefits of ice baths are purely psychological. Recovery time naturally increases with age, says Dr. Cardone, but aside from help with recovery for acute issues with overheating, ice baths aren't the recovery magic bullet athletes make them appear to be. Instead of an ice bath, take time to recover properly. Include cross-training in your workout schedule. Hydrate properly, quickly replacing fluids and energy lost. Refuel after workouts with protein. Make sure you warm up and cool down. Recovery isn't about one thing, it's about following all these guidelines to stay healthy, says Dr. Cardone. Do Plastic Sweat Suits Help You Lose Weight? What Causes Muscle Tightness Post-Workout? Do Solar Belts Work When I Exercise?